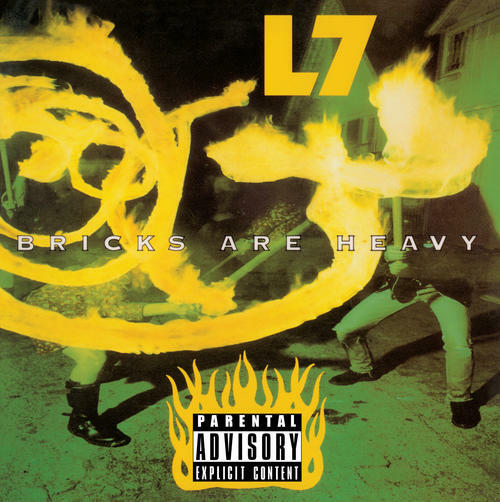 "Bricks Are Heavy" was the third album by L7 originally released in 1992. Produced by Butch Vig "Bricks Are Heavy" is somewhat poppier with more focused songwriting than their previous LP's and was the bands breakthrough album fueled by the success of the single "Pretend We're Dead". L7 was often associated with the then raging Grunge movement (even though they were from L.A.) and it's not hard to see why as the album features abrasive, sledgehammer guitar riffs and plenty of heavy rockers with the songs "Wargasm", "Slide", and "Everglade". The group emphasized their feminist and Riot Grrrl side with "This Ain't Pleasure" and "Diet Pill". First domestic release on green vinyl for this early 90s alternative classic.